Over the past 10 years Everett Aviation have been asked to support a number of specialised tasks and have consequently developed this capability. Africa and the Middle East pose many challenges both in logistics and security and Everett Aviation have developed many solutions to these challenges. From a logistical standpoint fuel and facilities are often the biggest issues. We have addressed this by the acquisition of an all-wheel drive fuel bowser that we are able to deploy to remote sites to ensure adequate supplies of clean, compliant fuel. We have also developed a portable hangar with workshops and dispatch facilities that we can deploy on site for longer contracts. With the support of both Eurocopter and the Kenya CAA, we have been able to develop approved modifications for a wide range of special role equipment. Our design team is always ready to discuss any special requirements. 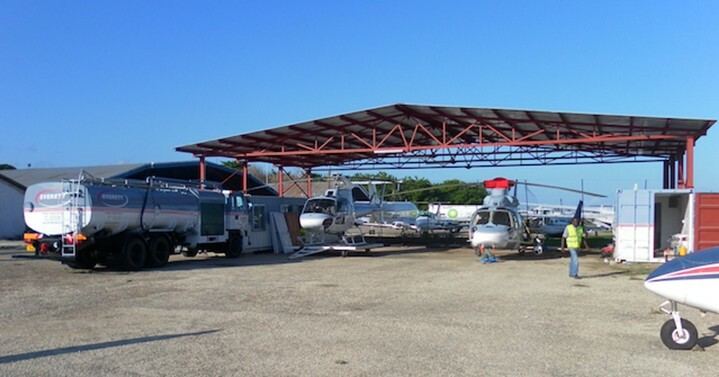 We are well placed to offer turnkey solutions with highly customised helicopters in short time frames. Besides the skills that each individual brings to Everett Aviation, the crews undergo a training program directly related to the operation's location and environment and also specifically to the modifications on the helicopters they are to operate. In addition to aircrew our helicopters are deployed with engineering support to ensure downtime is kept to an absolute minimum. Our engineers are all type-specific qualified and once again come from diverse backgrounds to ensure we enjoy the benefit of experience gained through operations worldwide.